We are leading manufacturer and exporter of Frypan (Round) with Stainless Steel Lid and our product is made up of good quality. Established in 1956 by Shri Om Prakash Kapur, OK Industries is a leading manufacturer of cookwares in the country. OK Industries is an ISO - 9001:2008 certified company and has grown consistently over the last 59 years. The company is also one of the few authorized license of the prestigious Teflon Coating by Du Pont Co. of USA. 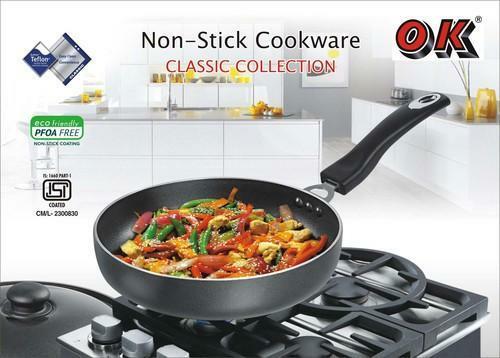 As of now, OK Industries offer a large variety of non-stick cookware, hard anodized cookware and Induction Base Cookware. Quality is of utmost importance to us and thus our products go through a series of stringent quality checks before they are ready to be used by the consumer. Our non-stick cookware bear ISI mark and are manufactured from aluminum metal. Our high-quality products have been certified by the Bureau of Indian Standards. We enjoy the distinction of being the sole supplier of cookwares to countries all over the world. We have an exclusive range of products which consists of Classic Collection, Platinum Collection, Titano Collection and Induction Compatible Cookwares. We have introduced new range named as Rock Series. We are one of the leading competent authority to issue Teflon License. The company is equipped with the latest machinery for production and quality control. We as a company encourage our distributors and dealers to perform better by offering them with attractive incentives.